Rossini scales new heights of the ridiculous in this delightfully silly duet for two baritones. Rossini was expert in making the ridiculous even more ridiculous. Take the nonsense plot of Il turco in Italia for example, which features a narrative raised to a level of sublime absurdity through Rossini’s delightful, inventive and often devilishly difficult music. The Act II baritone-on-baritone duet ‘D’un bell’uso in Turchio’ is a prime example. In it, Rossini deploys a traditional three-movement structure and makes the most of the unusual similarity of the voices to construct a fabulously silly portrait of two bickering men. Selim the Turk is on holiday in Italy, on the hunt for beautiful women. He strikes gold the moment he arrives with the free-loving Fiorilla, who’s fed up with both her husband, Don Geronio, and her lover, Don Narciso. She and Selim hit it off immediately, to the dismay of Geronio and Narciso. After much squabbling, Selim hits on a ‘remedy’ to Geronio’s distress, which he outlines to the abused husband: ‘Perhaps you’ve heard of a fine Turkish custom…’. Selim’s opening gambit is a dainty, ingratiating melody, which alternates light pin-pricks of notes with pushy leans. Selim takes his time but eventually gets to the point: ‘della moglie che gli pesa il marito è venditor’ – ‘when a wife becomes a burden, her husband becomes a salesman’. With self-satisfied loquacity he drives the offer home in increasingly ornate statements. The irascible Geronio immediately dives in with his rebuff, to the same melody. Like Selim, he is slow making his way through it – you get the sense he’s so angry he can barely talk. He spends rather less time elaborating his summary of his own fine Italian custom – that of the husband punching the buyer on the nose. An urgent transitional section has anxious semiquavers in the strings alternating with a strident figure in the woodwind. ‘That doesn’t need to be the case with us?’ asks Selim. ‘Oh yes it does’, answers Geronio, and beneath him the music modulates into a threatening minor key. But rather than race into fisticuffs, Rossini teases his audience with a return to the opening melody. Selim and Geronio sing together for the first time, each independently agreeing that ‘Prudence and courage are required’. A final transitional section has the men once again exchanging short phrases, while the orchestra follows them like a spectator at a tennis match. If Geronio won’t sell, Selim knows another custom – ‘involarla!’ (he’ll steal her). Speed is the order of the day in the presto finale, as both men, each now thoroughly het up, threaten the other with murder. The movement’s racing tempo takes no prisoners and puts the singers’ tongue-twisting skills to the ultimate test. Selim once again sings first, with Geronio echoing his melody (and his threats). After a brief transitional section the two sing together in final agreement that they’ll meet again with weapons, and each will see ‘that I cannot be frightened by threats!’. They storm off in opposite directions and the orchestra flusters to a finish in one of the most tempestuous, and ridiculous, of Rossini’s comic duets. 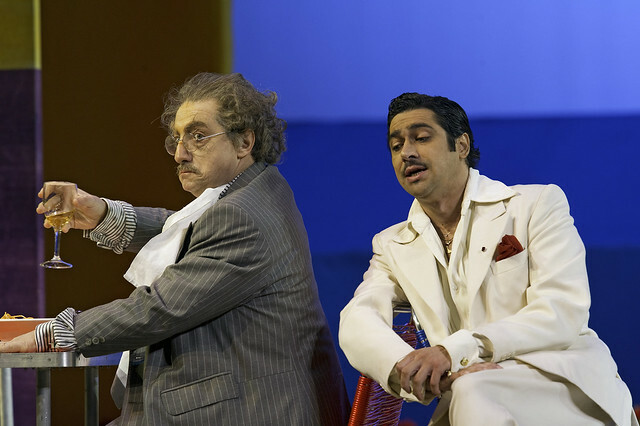 Il turco in Italia runs 11–27 April 2015. Tickets are still available. The production is given with generous support from Judith Portrait and The Friends of Covent Garden. What a delightful evening - orchestral magic, incredible voices and a laugh a minute! I'm even more in love with opera after seeing this. Thanks Fiona Le Roy for training us up as future ROH patrons!